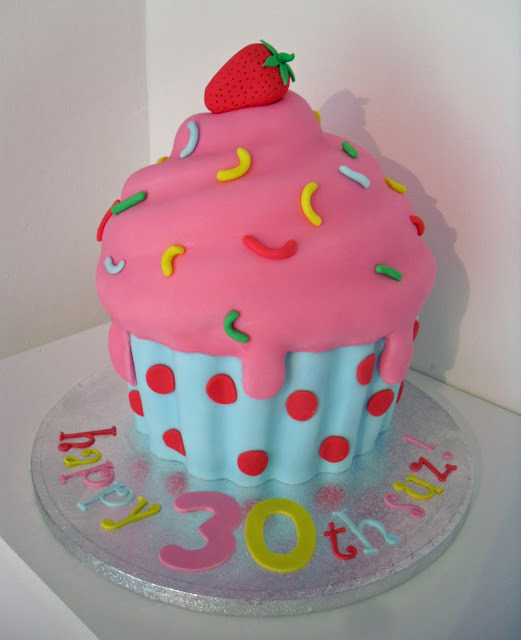 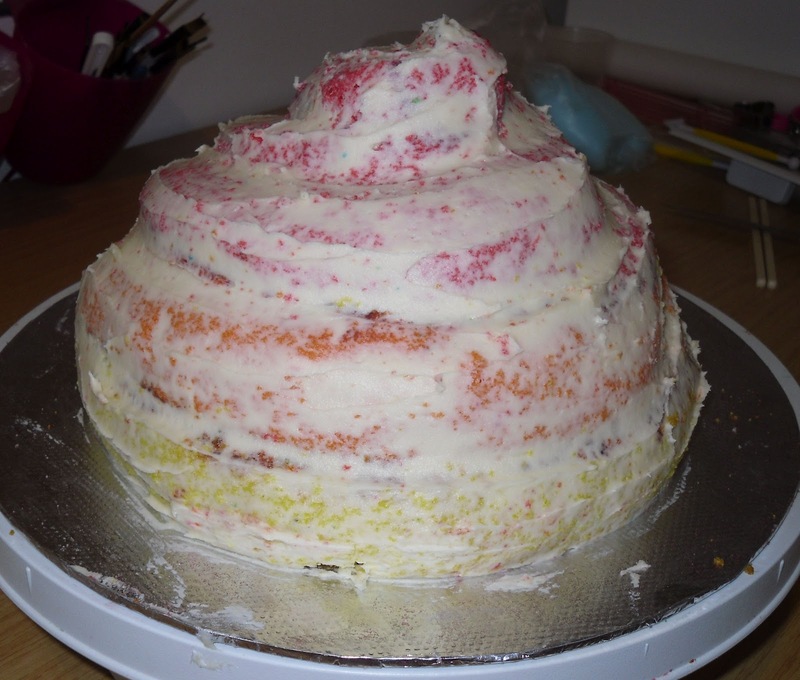 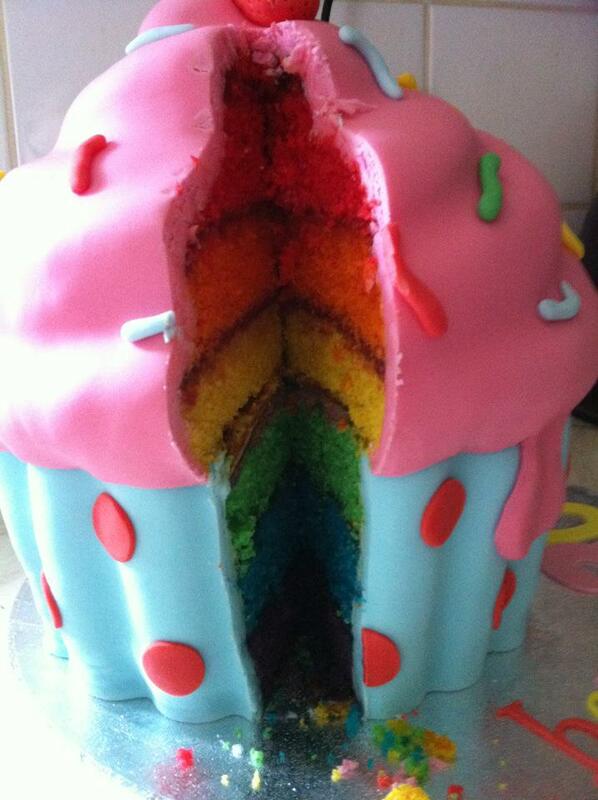 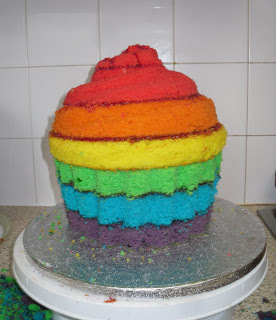 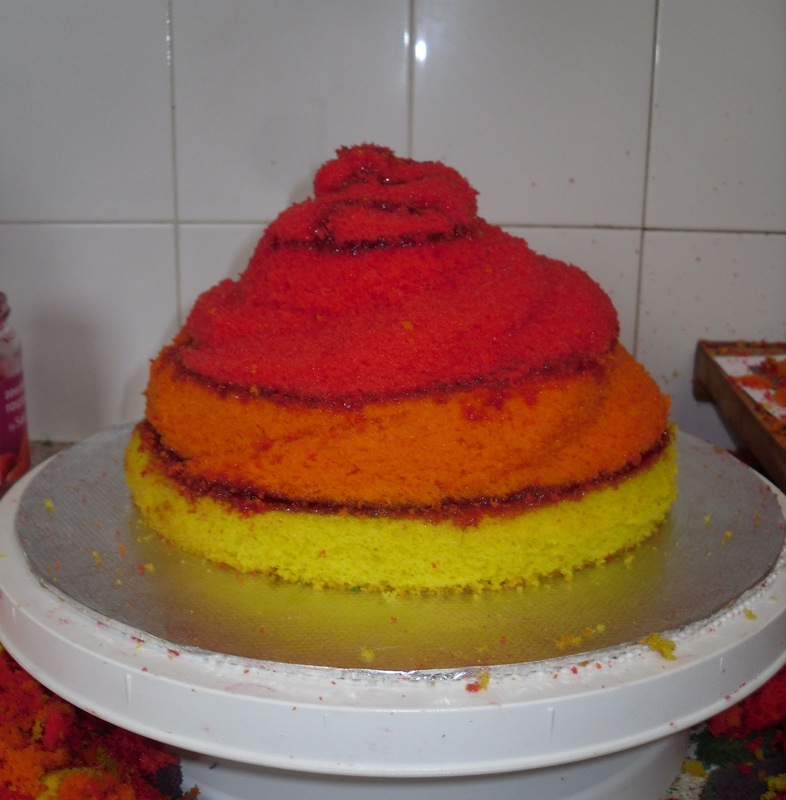 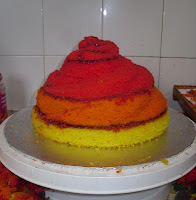 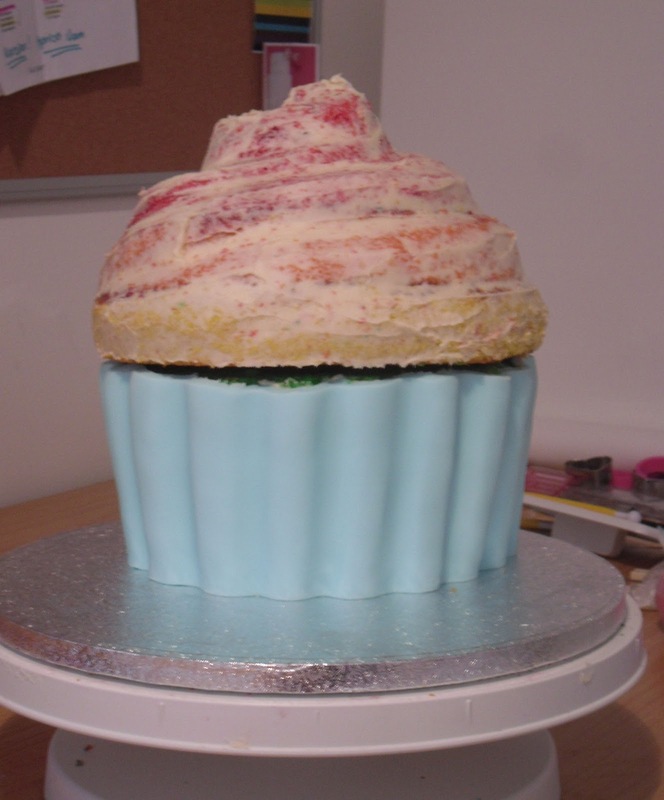 The Coloured Bubble Cakery: The Giant Cupcake!! 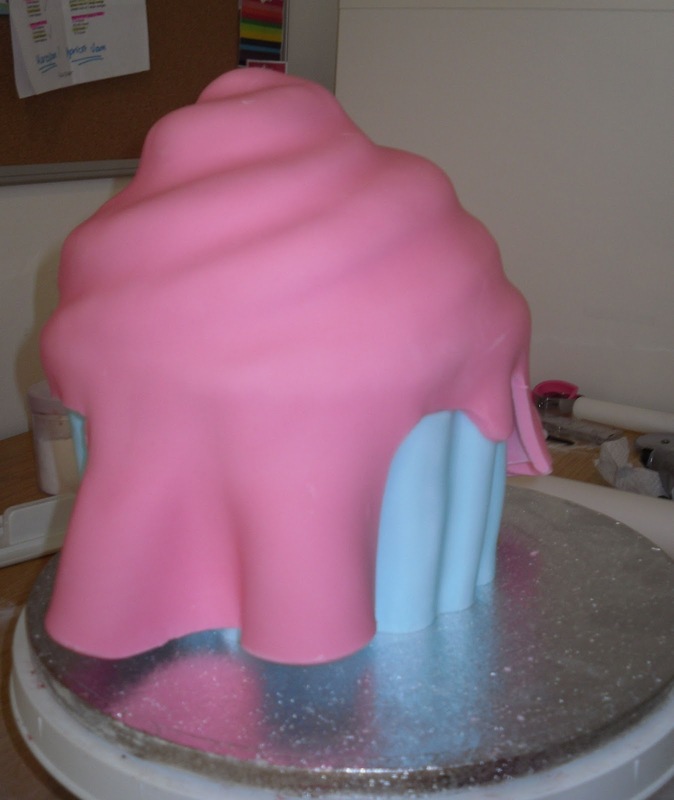 As promised, I've put together a bit more of an in depth blog post all about the Giant Cupcake!! 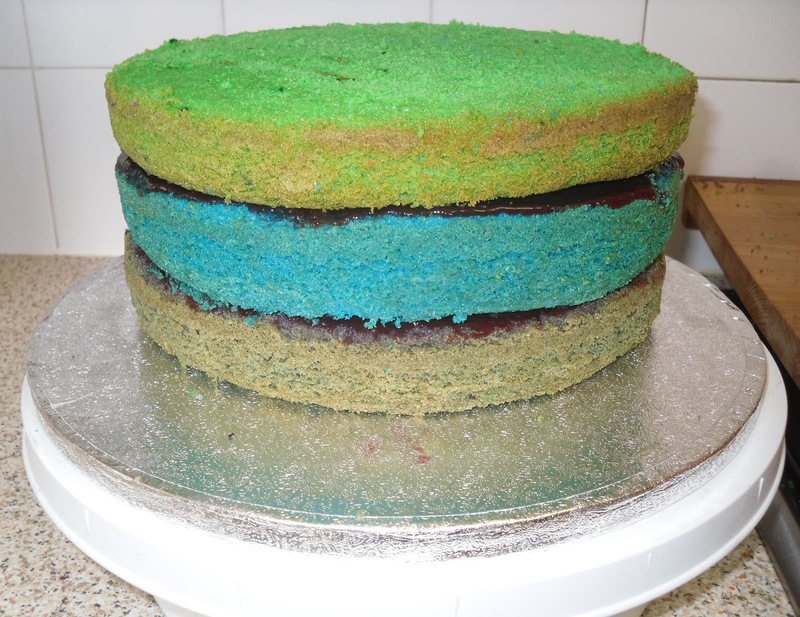 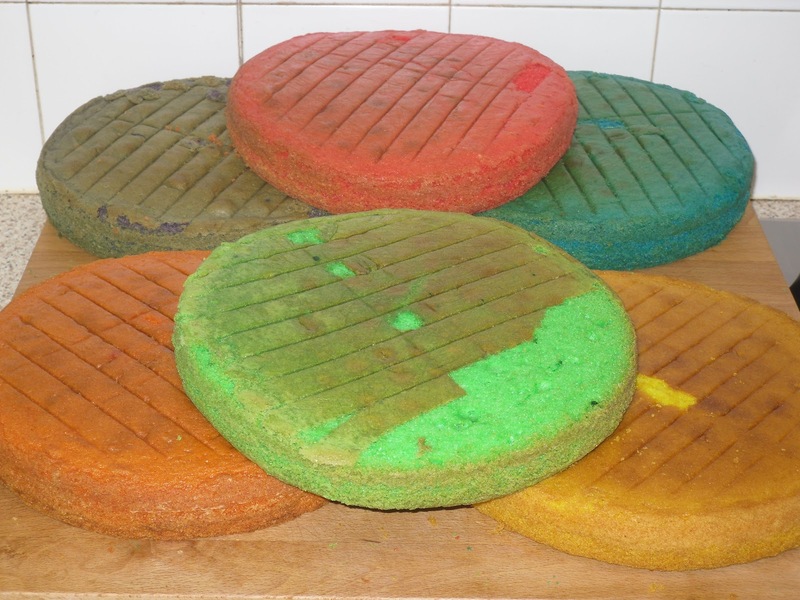 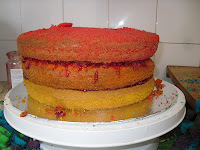 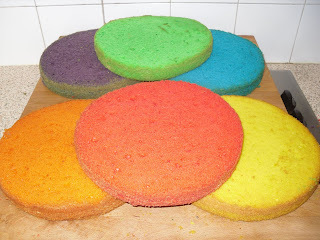 It's really easy to bake coloured sponges, it takes a little extra time but is definitely well worth it when you see the finished effect. 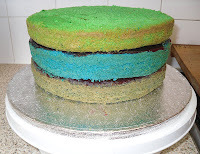 I use the same food colours that I use for all my decorating, they come as a paste and are perfect for mixing with icing, cake mix and even to paint with (watered down with vodka to avoid dissolving the sugar in the fondant!). 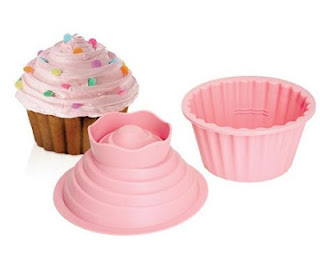 Now, for a giant cupcake cake you could always use one of these baking moulds... but where's the fun in that??! 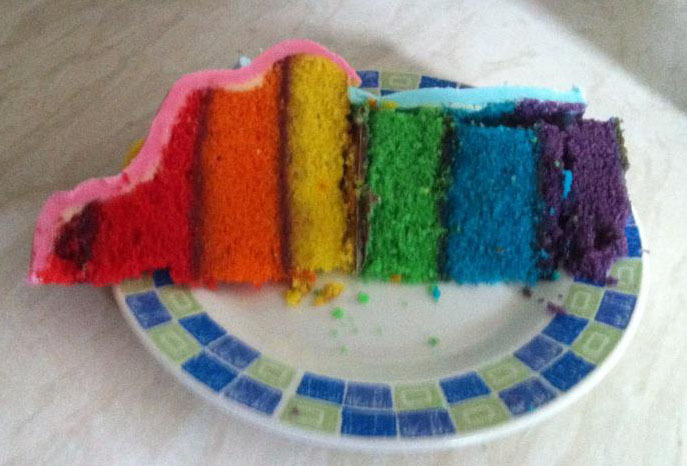 Nope, I much prefer my trusty bread knife! 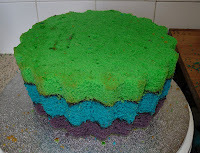 I decided to make this cake in two tiers to make covering it simpler. 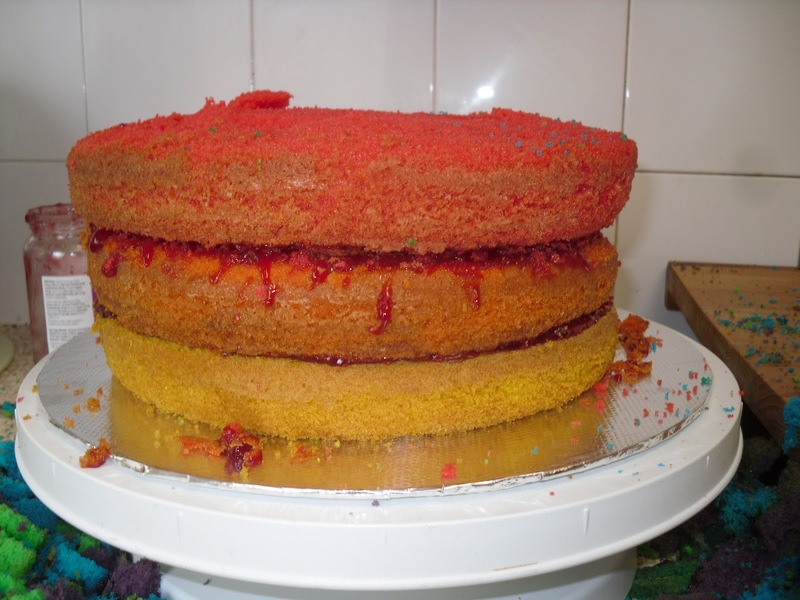 I've no idea if this is the way other cake decorators do it, but this is my way. 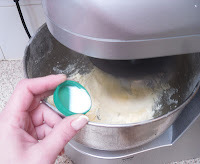 Ok, curiosity satisfied... Now it's time for the butter cream. Yum! Butter cream is so easy to make and there are a huge amount of recipes online to help you on your way. 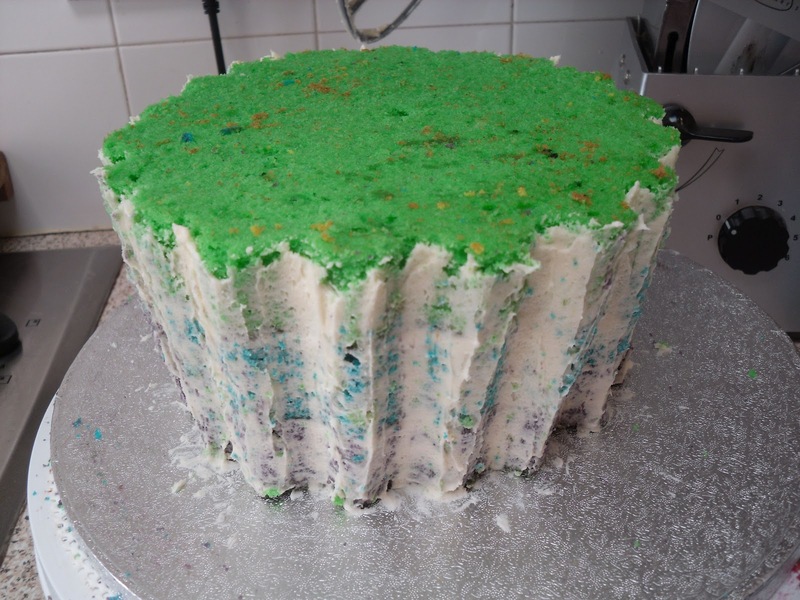 I can recommend 175g of icing sugar to 85g unsalted butter. 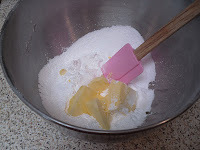 I like to heat the butter slightly to help it mix with the sugar, add a couple of drops of vanilla essence and you're off! 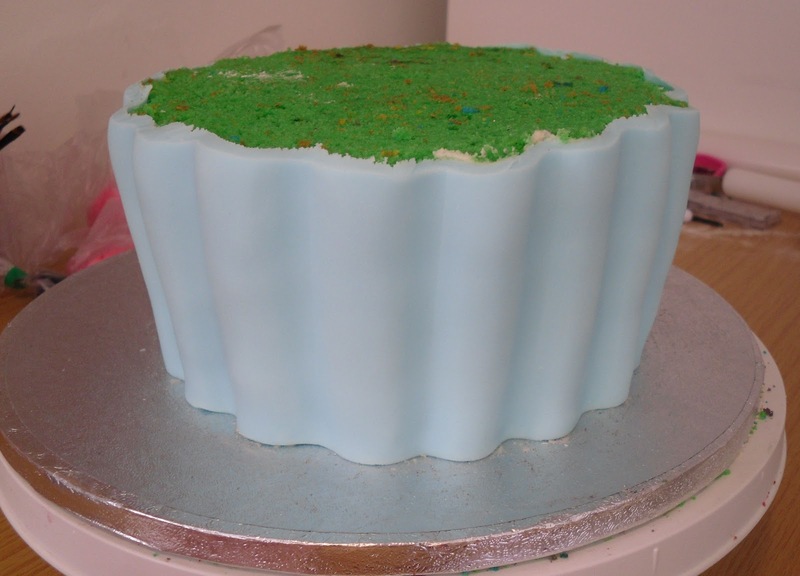 I used a piping tube to apply it as the cake was fresh & crumbly then I smoothed it over with a small palette knife. Next I wrapped the bottom tier in blue fondant, again leaving the top clear. The best way to do this, I find at least, is to roll a length of fondant long enough to go around the cake, then slice off one edge to make it straight, roll it up gently and then unfurl as you apply it to the cake with the straight edge against the cake board... trim the top excess off with scissors or a sharp scalpel (watch your fingers!). Using my fingers and palms I traced the the fondant into the grooves of the carved top to make sure it was all properly in place, an instant improvement in my eyes. 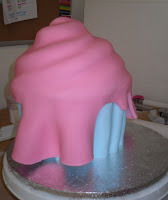 This was the first time I was able to properly see the job I'd done at carving the frosted top and I let out a massive sigh of relief as I stepped back to take a look! 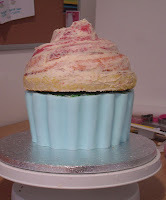 Next, with a sharp scalpel (watch your fingers!) 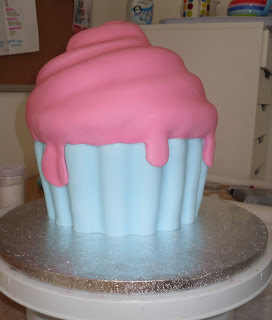 I trimmed the excess off the bottom, tucking the pink into the blue at the join, leaving little globules for icing drips... ta-da! Now you can add any decoration that takes your fancy.